Soak the rajma overnight or for alteast 5-6 hours. Wash and then cook in a pressure cooker with 4 cups of water for 20 mins till the beans become soft. Do not throw the water in which the rajma has been cooked. Heat oil in a pan and add the whole spices and the cumin seeds and fry for about about 10 secs. Add the chopped onions and green chillies and fry till the onions become translucent. Then add the ginger garlic paste and fry till the onions become golden brown. Add the chopped tomatoes and turmeric, chilli powder, cumin powder, coriander powder, garam masala and salt. Cook till the tomatoes become soft and the oil starts separating from the masala. If the masala starts sticking to the pan, sprinkle little bit of water. Now add the boiled kidney beans along with the water in which it was boiled and cook for another 5-10 mins so that the beans can absorb the flavor of the spices. You can mash some of the beans to make the gravy thicker. The consistency of the gravy can be adjusted by adding more hot water. Garnish with chopped coriander/cilantro and serve hot with plain rice or Roti. 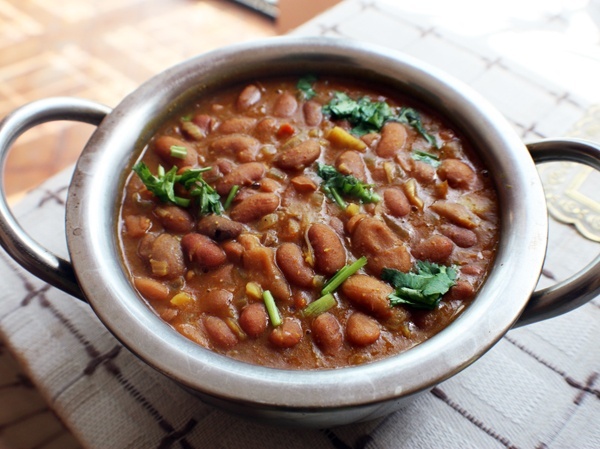 This entry was posted in All Recipes, Pulses & Beans and tagged Rajma Curry by Kamakshi. Bookmark the permalink. yay!! thanks di! needed this one badly! looking forward to many more yummy delights…..
Nice to see your comment on the site Anjali …. You can learn all the Nepali dishes and surprise my dear brother …Happy Cooking ! Tried the Rajma this morning. It worked. Thanks. You talk about grandma’s chicken pickle — do you have a recipe for that? It is nice to know that this recipe worked for you …. Yes, my Grandma’s chicken pickle , is under the Category of “Chicken” dishes.